Why Scotland you may ask! The answer is quite simple – Custom Tours has the local connections to create a very special package. Paul is a writer and tour guide, and his amazing depth of knowledge about Scotland, as well as his charm and sense of humor, will make every moment of your tour special. Lilian, who married and left the bonny hills of Scotland for the Green Mountains of Vermont, is now a tour director and guide for Custom Tours – and she will be making sure every step of your trip goes smoothly with our famous Custom Tours attention to detail. 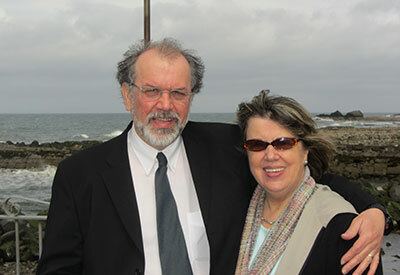 Both Paul and Lilian were born and raised in Edinburgh, and Paul still makes his home in this vibrant city. It is well known that having a personal contact at your tour destination goes a long way to ensuring that you will have a more intimate and in-depth experience, and not just a tourist’s overview. As your travelers dine on regional delights, explore the Highlands and the Lowlands, tour exciting cities and relax in bucolic villages, they will truly feel invited into the heart of beautiful Scotland. Both native guides will ensure that your passengers bring home not only lasting memories of Scotland’s gorgeous, rugged landscapes and thrilling history, but also of the warm and hardy people who bring it to life. Stay tuned for more updates as we progress with this new destination. If you are looking for a new tour package that will not be available to anyone else, that has the hands-on, local experiences and hidden treasures of a region, then you will want to travel to Scotland with Lilian and Paul of Custom Tours, Inc.! Don’t hesitate to contact us now. I’d love to share some of the wonderful things we have planned! Scotland has over 700 islands, including the island groups of Orkney, Shetland, and the Hebrides. President Linda Edelman of Custom Tours, Inc. was featured in Groups Today magazine where she was asked about her experience in the group travel industry. Custom Tours’ Play with your Food Tour was featured as one of the Top Ten Hands-on Experiences in the 2014 March/April issue of Groups Today magazine. Click here to read the article. Not only is Custom Tours fabulous to work with, their guides are so knowledgeable and helpful, and they are flexible. Custom Tours finds new, fresh places, and their tours are always exciting. I would not put together a Northeast tour without Custom Tours' help again! They're the expert and perfect for my business. No cookie cutter tour but one planned specifically for my clients. We see Custom Tours, Inc. as a leader in the motorcoach tourism business in Vermont and the surrounding regions. They work as a complete and detailed receptive operator to make certain that all of our clients' needs are met.... dynamic organizers and.. known throughout the state, thus making my clients feel that they are in capable hands. When considering a receptive operator, I demand a person who (1) knows the area better than me, (2) can open doors I can't open for myself, and (3) can give my travelers and me a superior experience both in terms of cost and content. Custom Tours goes out of their way to provide distinctive tour inclusions that no one else comes close to doing! We have NO OTHER RECEPTIVE that we trust so much. Everything works - timings, meals, etc. On top of that, they know my needs to a "T" and they make sure that every tour is set up in the manner that works best with my business model! Simply the best of the best! I love working with Custom Tours because I don't have to worry about a thing! They provide a well-planned itinerary and I know that all the hotels, restaurants, attractions, and guides will be top-notch. They work tirelessly to create a package that my clients want, are willing to tweak this and that to achieve the perfect tour. Strong points include an ability to (be) surround(ed)...with excellent employees and tour guides....always right on top of every detail and ...tours are well organized and professionally operated. A unique knowledge of what makes a tour successful from experience gained through years of traveling with tours throughout Vermont and New England. As Tourism Specialist for The Vermont Department of Tourism and Marketing, I have worked with Custom Tours for the past 12 years. For many years, I have trusted their expertise in the group market and I have asked for and depended upon their opinion more than once. Custom Tours also has a strong presence in travel and tourism worldwide, and understands the importance of niche markets in the travel industry from culinary tourism to outdoor recreation. We've worked with Custom Tours for the past few years.....(the) staff go the extra mile to make sure everything is perfect for our guests. Easy to work with, gets back to us quickly and knows what tour operators need. We have (the) number on speed dial! Custom Tours perfectly tailored a tour that suited the needs and interests of our large international delegation.....Our guide Suzanne was knowledgeable, personable and accommodating. As a travel professional, I have to tell you how much I appreciated Custom Tours' professionalism, creativity, and responsiveness as we built our Independence Road Tour....You understood intuitively what it was we were looking for and made proposals that met our needs. You were never reluctant to make changes that we requested. Custom Tours is a top-notch company that provides an excellent tour throughout the Northeast Coast. Not only do they provide great service, but they also book interesting one-of-a-kind attractions with unique touring and excellent meals. Their hotel choices are situated in picturesque settings with above average service. I highly recommend Custom Tours for your customers, you will not be disappointed and you'll get the most from your traveling dollars. —Linda Jun, Vandalia Bus Lines, Inc.